Transformations in the U.S. energy sector toward renewable sources have led to increased employment, more efficient energy use and procurement, and greater investments in technical innovation. Withdrawing federal support from the Clean Air Act, including the Clean Power Plan, will slow this progress but will not undermine it. Renewable energy and energy efficiency are now top employers in the United States and remain on a growth trajectory. 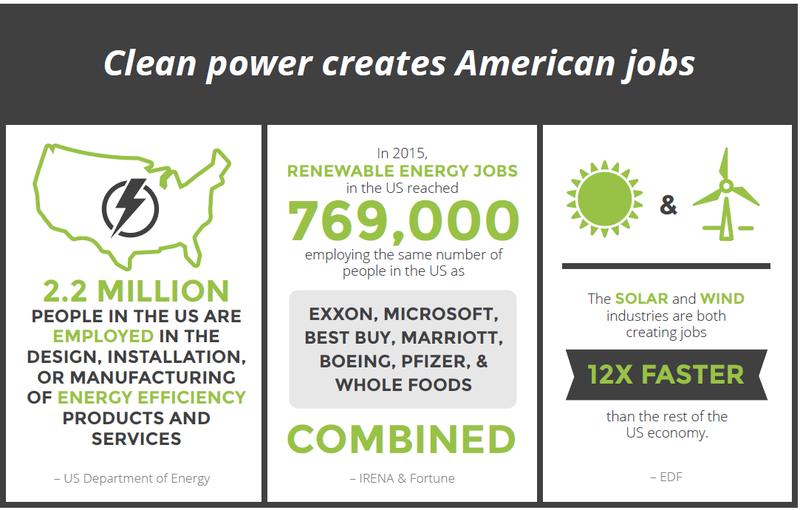 The solar and wind industries are both creating jobs 12 times faster than the rest of the U.S. economy. Renewable energy employment in the United States increased by 6 percent in 2015, reaching 769,000 jobs. Within the sector, the solar industry saw a 25 percent growth in employment in 2016, taking total employment to 260,000. This significantly exceeds U.S jobs in oil and gas extraction (177,000) and coal mining (50,000). In addition to renewables, employment in energy efficiency is also booming, with 2.2 million Americans employed in the design, installation, or manufacturing of energy efficiency products or services today. Last year, renewables became the largest source of new electric capacity for the first time in the United States. A recent article on Bloomberg Markets made waves this February when it announced that “U.S. solar [had] surged 95 percent to become the largest source of new energy.” New photovoltaic panel installations in 2016 more than doubled from 2015. Bloomberg New Energy Finance projects that total installed capacity in the United States will reach 105 gigawatts by 2021—a 276 percent increase from the 38 gigawatts installed today. What is more, renewables (including large hydroelectric projects) and natural gas now meet half of U.S. power demand, up from only 38 percent in 2011. Many companies are clear on the business case for renewable energy use and are shifting corporate procurement approaches. There are now 87 companies in RE100, a global collaborative initiative of the world’s most influential companies committed to 100 percent renewable power. Together, these businesses have created demand for around 107 terawatt hours (TWh) of renewable electricity—around the same amount of power consumed by the United Arab Emirates or The Netherlands per year. Goldman Sachs jumped from 14 percent renewable electricity in 2014 to 86 percent in 2015, H&M jumped from 27 percent to 78 percent in that same period, and Google—the largest corporate buyer of renewable energy—will power all of its data centers and offices with renewable energy in 2017. The figures translate into savings: General Motors has reported savings of US$5 million annually from using renewable energy, and this figure is likely to increase significantly as the supply of renewable energy increases. When it comes to investments, low-carbon technologies and renewables have shown strong growth trends toward becoming cost-competitive. Per a 2015 New Climate Economy report, the cost of solar power systems has fallen by 75 percent globally since 2000, and the cost of energy storage has decreased 60 percent. According to UNEP, global investment in renewable power capacity in 2015, worth US$265.8 billion, was more than double the dollar allocations for new coal and gas generation (estimated at US$130 billion in 2015). Lazard concluded that in 2016, solar energy beat coal in terms of cost: A kilowatt-hour of solar cost a median figure of 6 cents, versus 11 cents for coal. These trends show no signs of bucking, and their strength relies in part on the continued stimulus provided by city, state, and federal support. Many U.S. cities are implementing plans to cut emissions, including the largest two: New York aims to reduce emissions 80 percent by 2050, and Los Angeles is developing a plan for 100 percent renewable power. And states, such as California and Massachusetts, are considering bills to go 100 percent renewable no later than 2050. Therefore, regulatory support will further strengthen the business case outlined above. The energy industry in the United States, and all related industries, has undergone a significant shift rife with opportunities and in step with global trends: The Paris Agreement, which the United States along with 195 other countries adopted in 2015, will result in US$13.5 trillion investment in the new energy economy. The federal government has the power to ensure that these opportunities continue to thrive and that the economy remains on its prosperous path. As companies seek to reduce their environmental impact, meet climate goals, and reduce fuel costs, there is increasing demand for sustainable fuel technologies such as renewable natural gas, renewable diesel, electricity, and biodiesel.